posted: November 03, 2017 by: Mary Fuller DVM/Vetstreet Tags: "Clinic Specials" "News"
Nothing says family like Thanksgiving dinner. And since more than 90 percent of pet owners consider their dogs or cats to be part of the family, chances are, you’ll be tempted to share some “lovin’ from the oven” with your four-legged family members. But before we see the regrettable effects of overeating on our bathroom scales, our pets may feel the rumblings of remorse as well, in the form of vomiting, diarrhea or a sudden loss of appetite. In fact, abrupt changes in diet or too many rich, fatty foods are just a few of the reasons why veterinary clinics see an uptick in cases of pancreatitis (inflammation of the pancreas) and gastrointestinal upset right after Thanksgiving. Keep portions small and limit them to one or two new kinds of food (like turkey and green beans) rather than a smorgasbord of everything on the table. Watch what’s in the recipe: Onions, garlic and some spices can be toxic, and lots of butter, sour cream or bacon drippings can be high in fat. If necessary, cook something separately without the seasonings and sauces. Don’t leave food within reach of counter surfers and take garbage outside so your pets don't into it while you’re engrossed in the football game. Are there some things on the menu that may be more or less risky for your pet than others? You bet. Below is our pet-focused guide to the traditional Thanksgiving dinner. There’s usually nothing wrong with giving your pet small amounts of turkey, as long as you follow these rules: 1) Remove the skin (too fatty), 2) remove the bones (they can be swallowed, splinter and cause digestive tract obstructions), and 3) avoid raw or undercooked meat (potential salmonella risk). Since stuffing can contain ingredients that are potentially toxic or irritating to a pet’s digestive system, such as onions, leeks, scallions, garlic, raisins, grapes and various spices, it’s better to leave this one off your dog's or cat’s plate. A little dab of plain, undressed potatoes is usually OK to share with your pets. But if your recipe contains butter, cheese, sour cream, bacon drippings or other rich items, you should think twice about sharing it. Unfortunately, most gravies are too rich for dogs and cats. 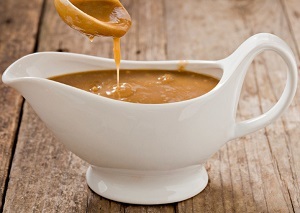 As an alternative, you could pour a little low-sodium chicken broth over your pet’s meal. 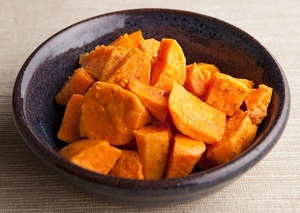 A bite or two of baked sweet potatoes may be just fine for your dog or cat. What’s not so good is the often-accompanying brown sugar or marshmallows. Be especially careful to avoid sugar-free marshmallows, which can contain xylitol, a serious toxin for dogs. 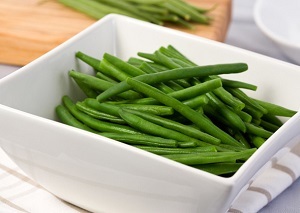 Even when it’s not a holiday, green beans can be a healthy, low-calorie snack for dogs and cats. But this Thanksgiving, make sure to skip the butter and fried onion toppings. 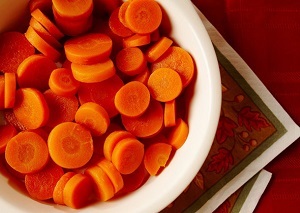 As long as you ixnay the sugary glaze, cooked or raw carrots in bite-size pieces should be fine for pets. 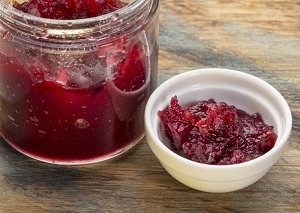 Some pets may not appreciate the tartness of cranberries, but they may give it a try. Be sure to avoid the sugary, bourbon-laden versions. A small bite may not do your pets much harm, but plain turkey or vegetables are really better options. 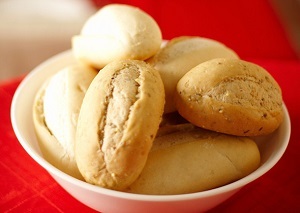 Which leaves you with more rolls for sopping up your favorite gravy. Veterinarians often recommend cooked or canned plain pumpkin as a dietary source of fiber for pets who may have problems with, ahem, irregularity. So you can imagine what happens if your pet laps up too much pumpkin. 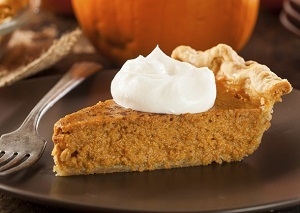 Also, canned pumpkin pie mix and the pie itself usually contain spices such as cinnamon, nutmeg, cloves and allspice, which may cause problems if eaten in large amounts. And the whipped cream may be hard to digest for lactose-intolerant cats and too rich for dogs. Of course, the safest way to show your pet love on Thanksgiving isn’t with food at all. Go for a romp at the dog park. Toss around some catnip toys. Or snuggle on the couch during halftime. After all, isn’t a healthy pet one of the best things to be thankful for?